Francis denounced the “merchants of human flesh” who traffic in desperation and called for greater legal channels for migration during a visit to a Catholic charity caring for the migrants who have flocked to Morocco seeking passage to Europe. The two leaders issued a joint appeal on Saturday as Francis arrived in the Moroccan capital Rabat for an overnight visit. The walled compound, home to the Al-Aqsa Mosque and the golden Dome of the Rock, is the third-holiest site in Islam and the holiest site of Judaism. Morocco’s King Mohammed VI is calling for more religious dialogue between Muslims and Christians and says education is the answer to religious extremism. Francis arrived Saturday in Rabat, the capital of Morocco, which last year became the main destination for sub-Saharan African migrants seeking to reach Europe. The man didn’t reach the king, who seemed not to notice the disturbance on Saturday. The man appeared to be waving an envelope as he tried to snake his way between the motorcade vehicles before being tackled. His fate was unknown. Francis is in Morocco for a quick trip to boost Christian-Muslim ties and show solidarity with the country’s growing migrant community. Pope Francis is praising Morocco’s efforts to promote an Islam that repudiates extremism as he opens a quick trip to the North African kingdom that has tried to distinguish itself as a beacon of religious tolerance and moderation in the Muslim world. Later Saturday Francis is heading to a migrant welcome center run by the Caritas Catholic charity. Pope Francis has arrived in Morocco for a trip aimed at highlighting the North African nation’s tradition of Christian-Muslim ties, while also letting him show solidarity with migrants at Europe’s door and tend to a tiny Catholic flock. Moroccan King Mohammed VI was on hand to greet Francis when he landed under a pouring rain in Rabat, the Moroccan capital, for a 27-hour visit. 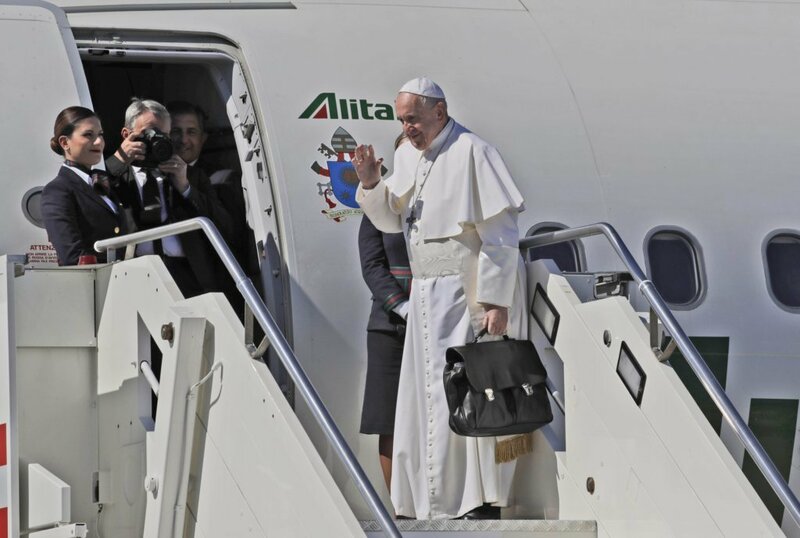 Francis will address the first two items on the agenda Saturday when he begins his 27-hour visit to Rabat, the Moroccan capital. He’ll tend to the third when he wraps up the visit with a Mass and a meeting with Moroccan clergy on Sunday. Morocco, a Sunni Muslim kingdom of 36 million, reformed its religious policies and education to limit the spread of fundamentalism in 2004, following terrorist bombings in Casablanca that killed 43 people.